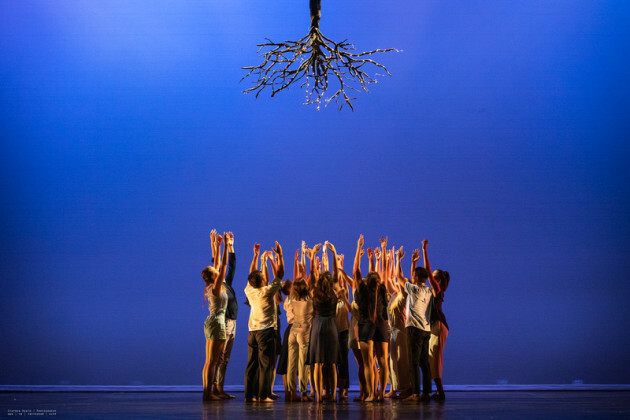 WAAPA’s end-of-year season “Verge” presented second and third year dance students in four beautifully staged and lit works. Suite Romantique is a lyrical celebration of the Romantic period of classical dance; Sue Peacock’s Bus to Paradise and Filipa Peraltinha’s Stirring Sketches of a Million Love Stories are new contemporary works; and rounding out the program was Rafael Bonachela’s 2 in D Minor, remounted by David Mack, who was in the original Sydney Dance Company cast. At short notice, the "Verge" season had to relocate to the Regal Theatre due to technical problems at the Geoff Gibbs Theatre, making the confident dancing and impressively realised technical aspects of the production all the more commendable; each of the works was seen to great advantage on the Regal’s larger proscenium-arched stage. Suite Romantique opened the program. An azure blue cyclorama with a glowing full moon provided an atmospheric backdrop for the flowing white, romantic-era costumes worn by the women. Two grand pianos were set at the front of the auditorium and played by guest international pianist Ciro Barbato and WAAPA’s Gennaro Di Donna, with gifted WAAPA music undergraduate Robyn Blann on the violin. The musicians provided superb live accompaniment to the creatively arranged excerpts (re-staged by Kim McCarthy and Danielle Hunt) from Les Sylphides, La Sylphide and Giselle, as well as an exquisite, newly choreographed section by Kim McCarthy to a commissioned composition by Ciro Barbato. Among many accomplished performances from the cast of over 20 second and third year dancers, Katarina Gajic was outstanding in the adagio section of the Act II Giselle pas de deux, with sustained, elegant, extended lines and beautiful feet. Her partner Marcell Stiedl also impressed in James’s solo from La Sylphide, as did Kirsty Clarke in the pas de deux from Les Sylphides and Sara Ouwendyk in Myrtha’s solo from Giselle. 'The Bus to Paradise' by Sue Peacock. Photo: Stephen Heath Photography. 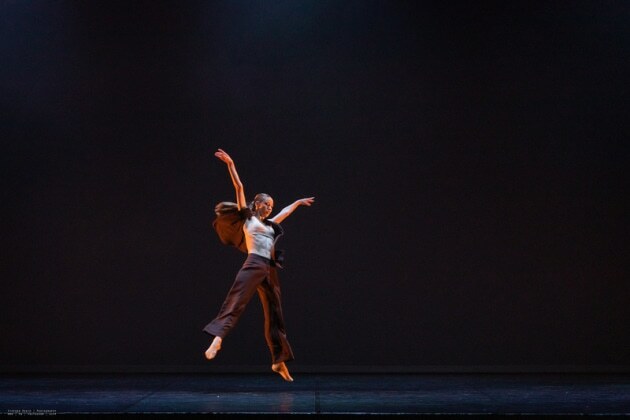 After interval was Filipa Peraitnha’s Stirring Sketches of a Million Love Stories, created on a large cast of over 20 third year dancers as a response to words by Portuguese writer Virgilio Ferreira. It is set to an eclectic range of recorded music from Bach’s Brandenburg Concerto No 3 in G Allegro and Saint-Saens’s The Carnival of the Animals' "The Swan", to soul-singer Donny Hathaway’s "Giving Up", with addition original music and edits by Azariah Felton. Set on a smoky stage with soft side and overhead lights, (lighting designs by Timothy Bonser), and dancers in simple loose costumes in blues and red tones, (one in white), the work has an emotional aesthetic. Stop-start pieces of "The Swan" continuously interrupt the flow of movement before the haunting cello sounds finally play through to the end. Sudden freezes create distinct images, groups form, pratfalls add welcome humorous touches, yet a sense of struggle prevails. Concluding the evening in impressive style was Bonachala’s 2 in D Minor, remounted by David Mack, and performed by eighteen graduating students. It is set to recordings of four movements of Bach’s “Partita No 2 in D Minor” which are interspersed with contrasting transitions of Nick Wales’s contemporary remixes, “2inD Miniatures” 1, 2, 3 and 4. Lighting designer Jasmin Lifford’s adaptation of Benjamin Cisterne’s original design makes effective use of overhead lighting, and the original costume designs of black pants and open jackets, and all-white for the transition solos, are by Bonachela. 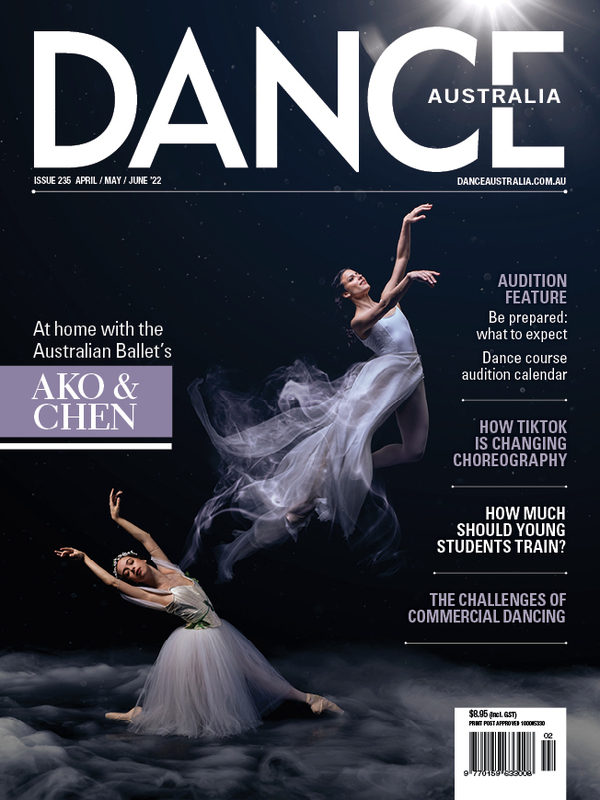 His choreographic language reveals a visceral, intensely musical response and the WAAPA cast was encouraged to “find pathways through the existing movement,” creating their own version “synonymous with Bonachela’s original intention”. The music demands unceasing momentum in solos, duos, trios and the well-synchronised groupings, and all of the dancers displayed admirable focus, agility, stamina and strength. Kirsty Clarke, Alexander Diedler, Marcell Stiedl, Alexandra Kay, Aimee Sadler, Makira Horner, Olivia Hendry and Emily Coles caught the eye in strong yet fluid solos, and undulating, lithe duos. Pictured top is Filipa Peraltinha’s Stirring Sketches of a Million Love Stories. Photo: Stephen Heath Photography.